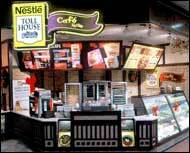 Nestle Toll House Cafe franchise business opportunity. Free Nestle Toll House Cafe business franchise information. The Nestlé Toll House tradition began back in the 1930's at the Toll House Inn near <?xml:namespace prefix = st1 ns = "urn:schemas-microsoft-com:office:smarttags" />Boston, Mass., where proprietor Ruth Wakefield became known for the rich, indulgent desserts she baked for weary travelers. While experimenting one day, she chopped up a bar of Nestlé Semi-Sweet Chocolate into tiny bits and added them to her cookie dough. Instead of melting through the cookie as she expected, the chocolate bits retained their shape, softening to a delicately cream texture. The Toll House Cookie was born and quickly became a favorite. Today we are pleased to bring you this legendary cookie and other delicious Nestlé Toll House treats fresh from our oven. Why Nestle Toll House by Chip? Nestlé is the world's largest food company with products available in nearly every country around the world. Nescafé is the world's largest coffee brand worldwide. Nestlé was listed, in The New York Times, as one of the 100 most powerful brands of the 20th century. The Nestlé Toll House Cafe by Chip¨ franchise offers individuals the opportunity to go into business for themselves, but not by themselves. Our team members coach Franchisees through the initial stages of site selection all the way through the grand opening of their store! Continued support and guidance throughout the term of the Franchise Agreement are standard protocol for Nestlé Toll House Cafe by Chip. Nestlé Toll House Cafe by Chip provides a system of support that is mapped out in our Franchisee Operations Manual. The Manual includes a comprehensive training program, proven methods for store operations and procedures documented for use in our Operations Manual. We also offer a dedicated staff for ongoing assistance, and a structured organization adaptable for change as the system requires. Each franchise is provided with written site selection guidelines and site selection assistance. In addition, we may provide on-site evaluations. Nestlé Toll House Cafe by Chip's highly structured training program was developed to provide Franchisees with the tools they need to be successful! Trainees will return from our comprehensive full-training program with new skills and the management knowledge it takes to be a Nestlé Toll House Cafe by Chip Franchisee! To learn more about the Nestle Toll House Cafe Cookie franchise opportunity, simply complete the form below.